There have been many wonderful cats that have touched our lives. Unfortunately we don't have pics of all of them scanned into the computer yet. Mactavish (Mac) - Mac walked up the stairs of my house on Halloween night, the year I was four. I was just leaving with my mother to do the rounds and there she was a tiny kitten making her way up the stairs. My Dad wanted to call her Candy, but that didn't seem to suit her. 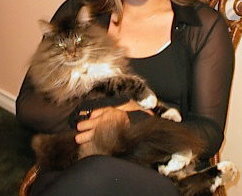 She was a long haired brown tabby. She lived until well into her teens and then just disappeared one day. Dad told me much later that he had found Mac in the garage in a cardboard box. It was about a week after she went missing. She was all curled up and looked like she was asleep. He waited until we were out shopping with Mom to bury her in the back yard. 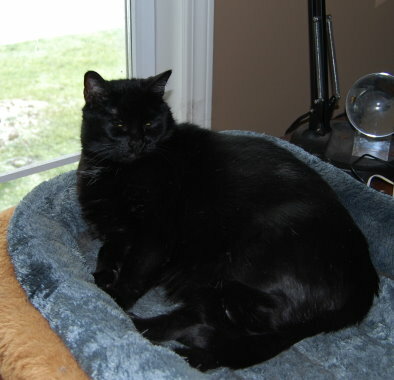 Muffin - Muffin was bought from the SPCA, but sadly she was killed in an accident in the car. She was a sleek black kitten. Samantha - Sam was a beautiful silver tipped white Persian. She was hit by a car in front of our house when she was still young. Ginger and Roo - I found Ginny and Roo at the side of a road in Vancouver in the pouring rain. They were only a few days old and I had to bottle feed them. But they survived and lived to the ripe old ages of 17 and 18. Ginny and Roo became my Mom's cats when I moved out to be married. They wouldn't leave the house they were raised in. Buffy - Buffy was our first cat after we were married. 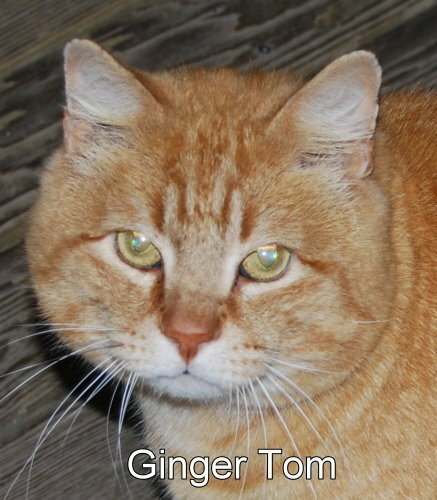 He was a shorthaired tabby. He was the most wonderful cat you could ever meet. He had so much personality he was like a person. Buffy lived with us in our first apartment, which he hated. 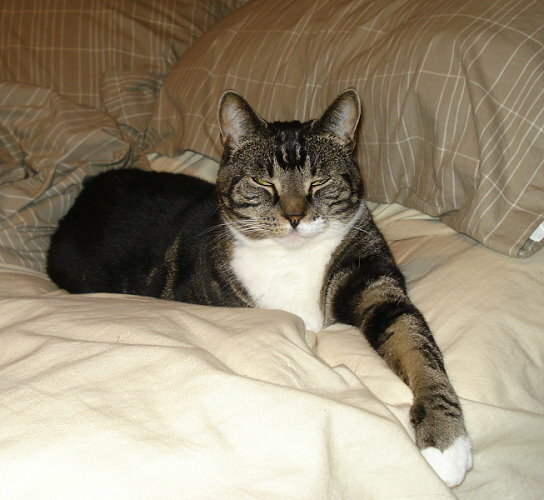 Then he moved with us to our house in Port Coquitlam, which he loved. He then moved with us to Kelowna and would go on camping trips with us. He also vacationed at the Empress Hotel in Victoria, where a lady mistook him for an ocelot! When our first baby was born, Buffy loved her and would cuddle with her and I at nursing time. He also loved our second daughter and made no favourites. 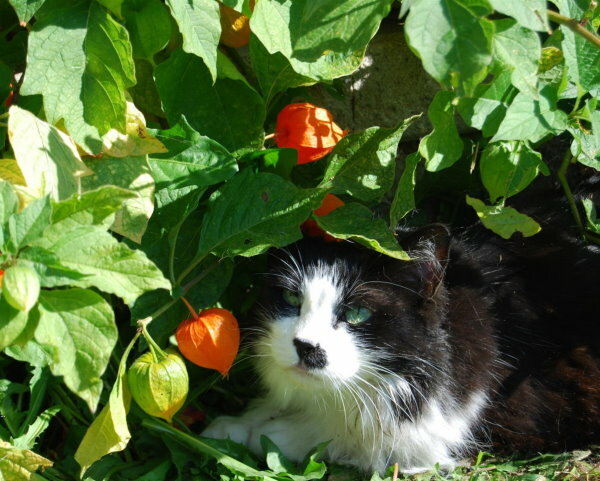 Buffy moved with us to Tsawwassen, where at the age of 15 he passed away. Thomas - We found Thomas under a some stairs at a warehouse. 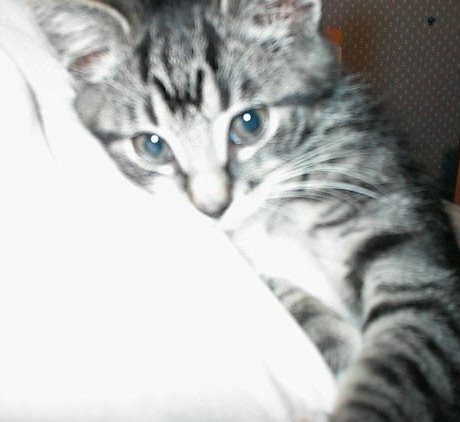 He was a tiny white kitten and he joined us in our new house in Port Coquitlam with Buffy. He and Buffy grew up together. He was a quiet unassuming, loving cat. One of my biggest regrets, is that he became ill while we were on holidays one year and I allowed the neighbour to take him to the vet where he was put to sleep. I will always feel badly for not having the chance to properly say good-bye to my Thomas. Tiki - Tiki was given to me by my Kindergarten class. Unfortunately she was killed by a car, very shortly after we got her. Beau - We got Beau from the SPCA. He was a cute black kitten. Shortly after we got him, he became very ill and it took several weeks for him to recover. I think his recovery was hastened by a very unusual treatment. One day after turning on the dryer, I heard a bonk, I opened the door to see a very confused looking Beau staring at me. He was only in the dryer for seconds, but his ordeal seemed to make him stronger and within a week he was well!! Beau went missing when we were on holidays a few years later. Taffy - We got Taffy from our neighbours, when their cat Tiffy had kittens. Taffy was a beautiful calico cat. She had long luxurious hair and was quite the princess. Taffy lived many years with us in Tsawwassen. In her later years she became quite frail and wouldn't come upstairs to sleep in the bedroom anymore. One morning I was on my way to school(I'm a teacher) and she was sitting at the top of the stairs. I petted her and said Good Morning Old Gal, unusual to see you up here. I went off to school, which was only a 10 minute drive. When I got there, there was a message to call home. My daughter was distraught, something was the matter with Taffy. I raced back home to find Taffy sleeping with her head on the doorstep, when I patted her, I knew we had lost her. We buried Taffy in the side yard of the house, the only place she had ever lived. 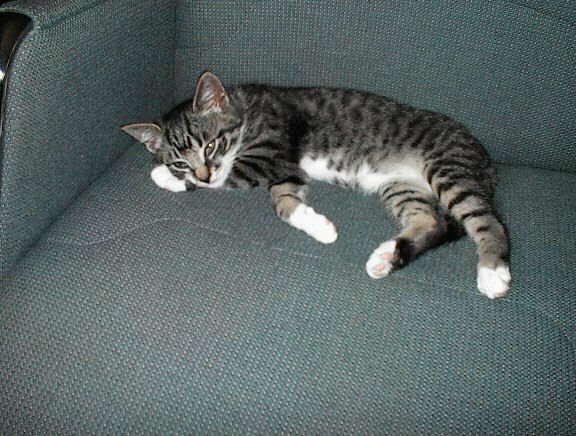 Teddy - Teddy was an SPCA cat too. He was my beloved Teddy. My soulmate after I lost Buffy. Buffy trained Teddy in that job I am sure. Teddy and I were inseparable. I lost Teddy when he was only 8 years old. We had gone out to dinner and my daughter called to say Teddy looked ill. I wanted to leave right away, but by the time we managed to get out of the restaurant and hurry home, Teddy had passed away. My daughter said he crawled into my chair and just went to sleep there. Teddy is buried in the side yard of the Tsawwassen house next to Taffy. Tigger - We bought Tigger from the SPCA for my daughter Brianne. He was her baby. 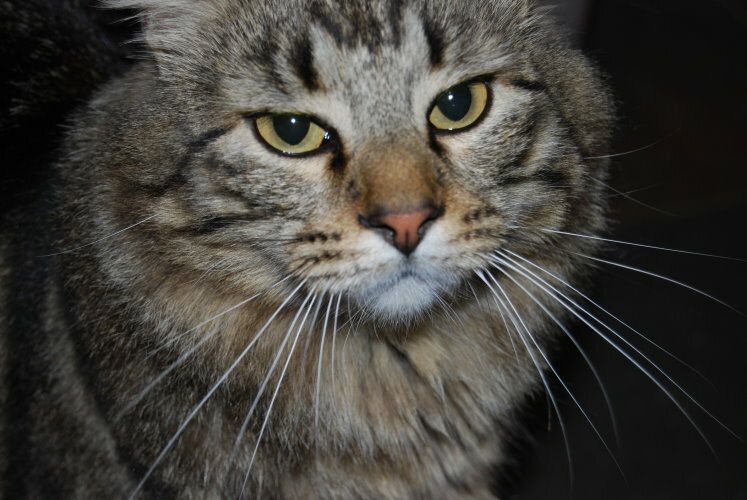 Tiggy was a longhaired brown tabby and a very beautiful one. He was full of personality and had the most wonderful character. Tiggy passed away at home on Thanksgiving, surrounded by the people he loved. I was petting him and Brianne was holding his paw. Tiggie is buried in the side yard of the Tsawwassen house with Taffy and Teddy. When we moved from the Tsawwassen house, we went and took a little dirt from each of their graves and put it in separate jars. We took it to our new home and buried them in the garden so our kitties could be with us there. BP (BushPuss) - Beepers, was found with her sister Bikini(a sleek shorthaired black) at the barn where we boarded our horses in Tsawwassen. In November of 2000 when the girls were 7 years old, we moved to Langley to a farm of our own. Bikini however would not come with us and remained with our good neighbours Barb, Jim and Amanda. When we visited her, she still knew us and would cuddle up. 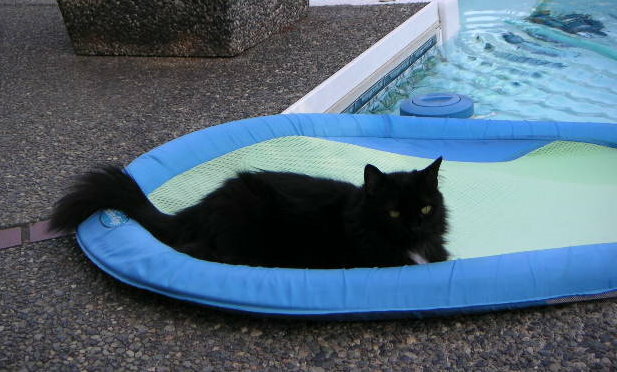 Bikini(whom Barb had renamed Tina) passed away in 2012. 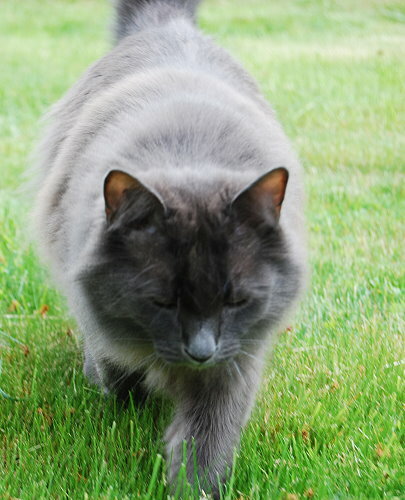 Beepers, was a beautiful Russian Blue mix. She moved with us to the farm and loved hunting mice in the field behind the house. The summer of 2001, she went missing and we suspect the coyotes found her. We still hope that she just wandered to the other side of the field and got lost and found a new home over there. Toby - My daughter bought Toby in September of 2000. He moved with us to Langley. He was the spitting image of Roxie. Two days after Beepers went missing, Toby went missing too. He probably shared the same fate as Beepers, but we hope he is living on the other side of the meadow with a new family too. I first met Cisco, when one of my students brought him to school to show me the kitten his dad had found in the warehouse where he worked. 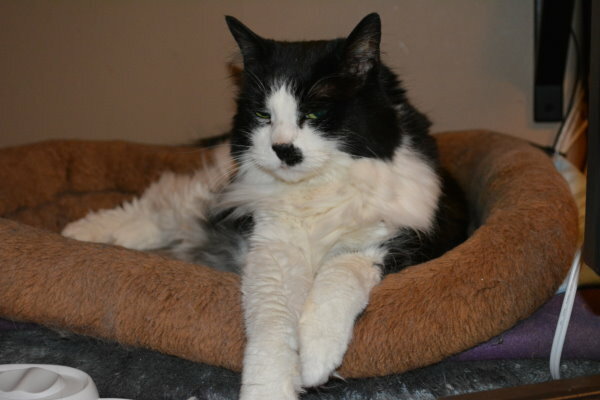 Cisco was his own cat and he eventually proved too much for this kind and loving family. They worried about his constant wanderings and finally in his second year, they asked if I would take him to live at our farm. We agreed and Cisco moved to the farm. He became great friends with Charlie and the two were inseparable. 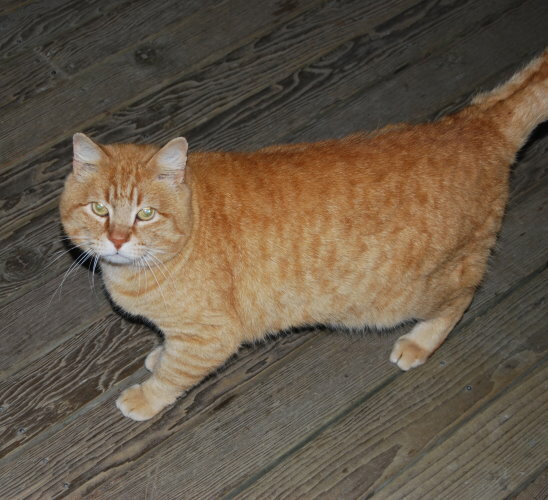 Early in the summer, Cisco did not come home for dinner and although we called and searched, we never saw him again. Charlie missed him greatly and so did the rest of the family. Here is his page......Cisco. Panda was found on January 29, 2002 in the middle of a snow-covered field. Brianne had been working in the barn and kept hearing a cat meowing, she couldn't find it anywhere and continued her work. Suddenly Cole, her Malemute, bolted from the barn and raced off towards the field. Brianne was furious with him, thinking he was just running off and she raced after him, thoroughly intending to give him a good scolding. When she finally caught up to him, he was sitting staring at a rock. On top of the rock was a very tiny white and black kitten. Brianne scooped her up and took a hasty look around for others. When I arrived home from work, Panda was waiting for me. She had cried so much, she had no voice left, she was cold and hungry. I spent the evening holding her tucked into my sweatshirt and feeding her watered down cat food. She slept and ate and slept and ate. Pandy never got over that traumatic experience, in that she did not trust anyone but me and she was never very cuddly, although she did like to be petted and scratched on her own terms. By the summer of 2006, she was beginning to like being scratched and petted and was actully sleeping on our bed each night. I loved that little girl so much, because of her shyness, gentleness and sweetness. September 27, 2006 is a date I will remember. We were at the Elton John concert, when we arrived home Panda had escaped. I had to work the next day, so left the cat door open for her. By nightfall, she hadn't returned, so I left the door on "in only", but I closed the laundry room door to keep the rest of the cats from scratching at the door. Well, Panda came home that night, but she scratched and worked at the door until she broke it open. I always think that if I had left the laundry room door open, she wouldn't have done that, she would have come up to bed like she always did. Early the next morning we were awoken by the sound of coyotes in the next field. I knew they had found her. It seems ironic that she survived in that field as a tiny kitten and we saved her from the coyotes then, but they claimed her a mere 4 years later. Panda was always a bit wild, maybe she returned to the wild and is still living out there, wild and free. We don't hear the coyotes so much anymore, now that they built the housing development behind us. We have lost so many kitties to them, that I am not too sorry to see them go. I am sorry for the coyotes loss of habitat, but I am happy to see them move further away. Perhaps our surviving kitties will stand a better chance. Here is Panda's page..........Panda. Tizzie came to us in the summer of 1996 as an eight week old kitten. We quickly calculated the date of her birth which brought us back to the begining of May. As my Mom had just passed away I gave Tizzie my Mom's Birthday, May 3(then we found out Mom's actually birthday was May 2 as she was a twin and she was born on May 2 and her twin on May 3 and they always celebrated on May 3). Tizzie became my soulmate. She was a beautiful girl and had the "Princess" looks and attitude. She was the ruler of the house, but she was a kind and gentle ruler. Any kitten that arrived at our house was immediately taken under Tizzie's wing. She was a great mother to them all. On November 17, 2017 Tizzie left us. She had contracted pneumonia in August of 2017 and had successfully fought it off. On the morning of November 15 we were preparing to leave for a trip to Disneyland and Palm Springs with my daughter and her son. I noticed some wheezing going on with Tizzie and I called the vet, Dr. Machine. She said she'd be right down to check. The penumonia had returned so Dr. Machine said we should go on our trip and she would visit Tizzie everyday to give the medicine and a little check up to cure the penumonia again. Our neighbour was going to be taking care of the cats and dogs and so a plan was formed. That was a day I hved lived to regret. I should never have left. Thursday's reports from the neighbour, the doctor and my other daughter were good. Jillian, my daughter who sounds very much like me said Tizzie was alert and she cuddled her and left her snuggling down for sleep. The next morning, November 17, I got a frantic call from my neighbour. Tizzie wouldn't eat, or drink and seemed very weak. She had called the doctor and she was on her way. When the doctor arrived she immediately called me and sent me a video of Tizzie. She was in distress and I said I would be on the next plane back, but the next plane was 3 hours away and a 2 hour plane ride home. Dr. Machine said, she wou't make it until then and she is in distress. My neithbour video called me and when I spoke to Tizzie she turned towards the phone and tried to get up. It broke my heart to think I had deserted her when she needed me. I had sworn to myself I would be with her and I was gone. My neighbour sat on the floor and put my jacket over her knees and held Tizzie so she could smell me on the jacket and held the phone up to her so she could hear me talking to her. Tizzie passed away quictly listing to me talk to her and tell her how much I loved her. I don't think I will ever get over leaving her. I truly thought she would respond to the treatment as she had before and be there waiting for me to return home to her. Night, night Baby Girl, are you coming to bed? Spider was a case of mistaken identity. I thought he was the neighbour's cat Spider so I took him over to her. Nope wasn't Spider, but she kept him anyways. Well, he took up with a cute little barn girlcat and in three days time he was back at our house with his girlfriend. Within a month the happy couple had moved into our barn. By 2016 they were full fledged house cats. Sadly, Spider, who only ever wanted to be a house cat, had only two years of his dream come true. Spider passed away, at home, naturally, January 16, 2018. Three weeks earlier he had been diagnosed with Lymphoma. It was so sad, how quickly he succumbed. He was his old self until three weeks before he passed. I noticed he seemed lethargic and suddenly felt very skinny, with his big winter coat on it was hard to notice until one was petting him. I took him to the vet the next morning and blood, tests, scan, and x-rays showed a large mass in his large intestine. Further testing by the specialist hospital confirmed what we feared. Spider came home with some meds for palliative care. He was great for two weeks and then he began to decline swiftly. He began having seizures and I called the vet to say that things were getting worse. The night before he passed away, I brought him to bed with us and he layed on his bed between us and never moved. The next morning he was not responding to me at all and I called the vets to confirm our appointment. Suddenly he began vomiting and convulsing. I held him through it and he looked up at me, looking horrified and helpless until he passed. He wanted to live and his body fought to stay with us, but the disease had taken too big a hold and there was no stopping it. My vet told me when I called her and said we didn't need her to come, that cats were like that, you never know if they're sick until they're really sick and often it's too late. Spider was a feisty but very loving kitty. Minnie misses him greatly. At least he enjoyed two years of house cat bliss. RIP Spider, you are loved and missed.